If you think that family rambling is just about walking around the countryside with various members of your family, think again! There are lots of rambling activities that you can do as a family for some all-important family fun. Rambling is a great way to get your whole family to do some exercise without remembering that they are actually doing so. 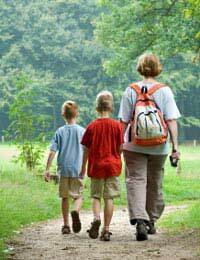 This article offers advice on taking part in family rambling activities. This is the most obvious rambling activity that you can do together as a family and it is a nice way of combining a typical family day out with physical exercise. However, if you suspect that this will not be enough to keep everyone suitably occupied, there are various activities that you can add in to the experience to make it more interesting for younger family members. This family rambling activity also provides the opportunity to teach your children about the countryside around them and how best to respect it (for example, teach them the Countryside Code). This is an example of good parenting too, so you can kill two birds with one stone. Depending on where in the UK you are doing your rambling, you might be able to spot some birds of prey on your treks. Golden eagles and buzzards can be seen in some areas, so you can have some fun deciding whether you can see any of these en route. In the Lake District, you can also see animals such as otters. To see otters and other small land mammals, you will often need to be up and about in the early morning, which is often problematic where children are concerned! For this, you will usually need to organise your own family ramble, as local rambling groups are unlikely to organise early morning walks. In some areas of the UK, you can look out for different types of rocks. For example, in Derbyshire, keep an eye out for rocks such as white peak and limestone. This can keep children occupied for hours! A family rambling trip can be a good opportunity to teach your children outdoor survival skills, such as map reading and using a compass. This is good parenting, even if you suspect that they will never take to the countryside without your expert persuasion! You could even turn the situation into a game to make it fun, especially if there are prizes for the winner(s). If you want to get the family together for some fun and exercise, why not go rambling? Contrary to popular opinion, you are not restricted to simply walking around the countryside, as there are a number of different activities you can do as a family. Some local rambling groups specifically cater for family groups, and offer rambles that are just for families. This usually means that there will be a big effort made to make them fun for children, so they can take that problem right out of your hands!